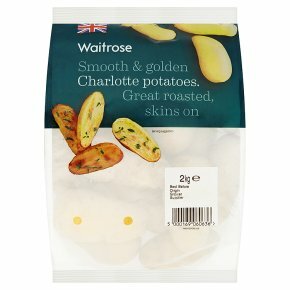 With a firm creamy texture, golden colour and full flavour, these Charlotte potatoes are especially delicious roasted with their skins on. Cut in half, they cook in the same time as the smaller Charlotte and still have the same great taste they're just that bit bigger so they go a bit further. Wash before use Warning: Plastic bags can be dangerous. To avoid danger of suffocation, keep this bag away from babies and small children. HOB - BOIL - 15-20 MINS Scrub and rinse the potatoes well to remove any soil and place in a pan with just enough water to cover and bring to the boil. Cover and simmer for 15-20 minutes or until tender.